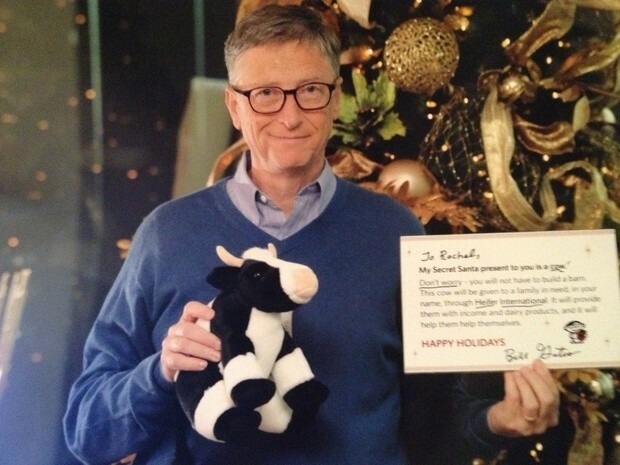 24-year-old Reddit user "NY1227," identified on her profile as Rachel, received the shock of her life when she opened a Secret Santa gift via Reddit only to discover it was from Bill Gates. In lieu of the makeup, nail polish and other glittery things on her wish list (including an Apple iPad - awkward), Gates instead donated to a charity on her behalf. Rachel recounts the experience on Reddit, noting how she received a 7-pound package shipped overnight. Inside she first found a cow stuffed animal followed by a card addressed “to Rachel, from Bill.” She then found the bit about the donation – a cow to a needy family on her behalf. The charity, Heifner International, aims to give families in need the right tools – such as animals, seeds, clean water, safe stoves or a chance for girls to go to school. The last part was especially fitting as the Reddit user said her master’s degree is in education. Next was a travel book, National Geographic: Journeys of a Lifetime, which was another fitting gift as she professed her love for travel in her likes and dislikes section. She quickly skipped passed the message and signature on the book from Bill, still not realizing who had sent her the package. That is, until she opened the last portion of the gift – a photo of a man holding a sign. Yep, it was Gates posing with her gifts. Love or hate the guy, you gotta admit that’s a pretty thoughtful gift. Job well done, Bill.